i surfed Sano yesterday with Max. it was super small, but we had a gig later at the Surf and Sand Resort so we paddled out anyway. i caught 5 waves on the Slick Rick, which brings my total wave count to 150.
my right shoulder has been hurting lately. i hope it’s a temporary injury. i’ve surfed twice since my last post. surfed Bolsa on the Slick Rick. i switched the quad set up…….smaller fins up front, larger on back. it was small and blown, but i caught 10 waves. yesterday i surfed Sano with Max after our gig at the VW Jam in Irvine. i met a dude from Craigslist in San Clemente and bought a used 9″ Greenbough Flex Fin for $25. i put it on the Slick Rick with no sidebites. even though the waves were small, i felt that “glide” that i didnt have with the quads….and yet there seemed to be enough control to still bank off the lip from time to time. cutbacks were nice and easy too. my current wave count on Slick Rick is 145.
i think ill stay with this single fin set up for awhile. also, i cant help but wonder what a 7’+ Liddle Hull would surf like? this “hull” thing is new to me, so i’d really like to try a longer hull. by the way, we stopped at Stewart Surfboards to purchase a Wonderbolt for the new fin. 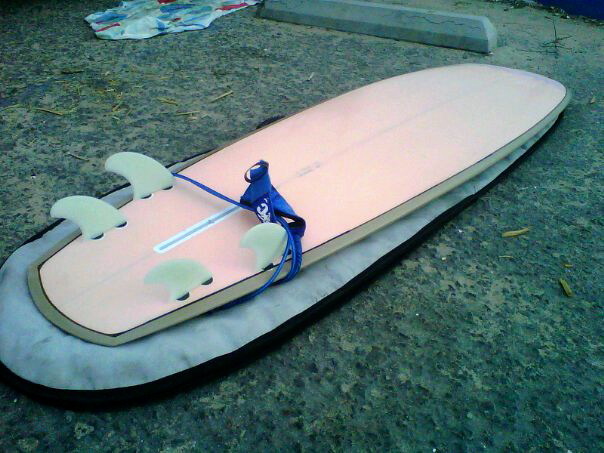 while we were there, Max bought a used Bruce Jones quad……..6’10″x23″?x3 1/4″………crazy fat and wide board! i was surprised to see him do so well so quickly, given the fact that he’s been on much longer boards recently. i’ve been lagging on this blog. i surfed Sano, caught 12 waves. surfed Sano the next day and caught 12 more waves. surfed Bolsa and caught 5 waves before the lifeguard escorted me out of the water. i rode all of these waves on the Slick Rick with the quad set up. my current wave count on the Slick Rick is 124.
although i have the board working well, i still don’t feel like i have it completely dialed in. maybe because i keep changing the fin set up. i’ll keep riding the Slick Rick with the current quads for at least another 50 waves. Slick Rick with the quad set up. my total wave count on the Slick Rick is 95 waves. to see a few photos of the day, visit the new Sandy Bus site.